we have decided to discontinue the development and remove the app from the App Store effective immediately. Back-end services supporting the app will be running until 2014.01.01. This means current users will still be able to use Locate until 2014.01.01. 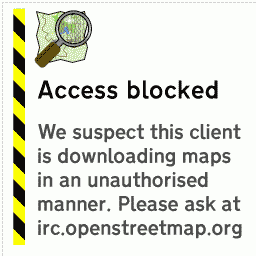 Earlier this week it came to my attention that OpenMaps' access was blocked to the OpenStreetMap "Mapnik" tile servers. We suspect that the reason why it was blocked is a tool named the Download tool. The Download tool enables users to download an area of a map from a given map tile server, even custom ones. Users were using this tool to download map tiles from the OpenStreetMap "Mapnik" tile servers and with this behavior they were violating the tile usage policy of OpenStreetMap. We are very sorry for causing such a problem for the OpenStreetMap project. To our defense, the tile usage policy wasn't available when we first introduced the Download tool in OpenMaps. - Download tool is still present with a clear discouraging message that it should not be used in abusive behavior. - Maximum of 2 download threads. - Download disabled for 17, 18 and 19 zoom levels. - User agent of non-bulk downloading of map tiles was changed to "Op3nMaps(Not.Bulk.Download)/x CFNetwork/x Darwin/x" while the user agent for bulk downloading remains unmodified (OpenMaps/x CFNetwork/x Darwin/x). This way browsing and bulk downloading users can clearly be identified on the server side and throttled or banned if necessary. This is our short term solution for the problem, but the long term solution is clearly a vector based renderer. I previously alluded that it is coming on my twitter profile. OpenMaps is a powerful iOS app based on maps and web services around OpenStreetMap. To date it was downloaded more than 250.000 times and as of 2011.09.07 it is the 7th most popular OSM editor.